There are many beautiful places to visit in Canada and with its rich history, thriving arts scene and beautiful waterfront, Kingston, Ontario is no exception. The original capital of United Canada, Kingston was a popular spot frequented by Canada’s first prime minister Sir John A. Macdonald. Old Fort Henry is one of Kingston’s most popular historical sites. Located on top of Henry Point, old Fort Henry was constructed between 1832 and 1837 to replace an existing structure from the war of 1812. When you visit the historical site you can fire a rifle, take a tour, dine, shop or even experience a Victorian era classroom both in English and in French. For those who aren’t into history, there are also opportunities to tour Kingston Penitentiary, swim in the St. Lawrence river or tour Ontario’s oldest market for fresh produce and handmade items. As beautiful as Kingston is during the summer months, it is equally stunning in the winter months covered in ice and snow. The average winter temperature between -12 and 2 degrees Celsius but the mercury can dip as low as -20 degrees. As beautiful as it is outside, with such extreme temperatures it’s important to have a comfortable place inside. One of the best ways to achieve this is in Kingston is with a high efficiency gas furnace rental. When it comes to upgrading your heating system, traditionally there wasn’t many options for the consumer. If your furnace failed, you were stuck calling company after company looking for the lowest price, the best deal and the most honest company. Once you have found a company that was available and affordable, you were then tasked with coming up with thousands of dollars to buy a new system and have it installed. This type of big ticket investment with little to no notice is hard for the average consumer, when most have thousands of dollars in their bank account saved for a rainy day. Luckily, today’s consumer has another option. They are able to instead choose to rent their heating unit and not only receive an energy efficient system but also the coverage that comes with a rental agreement. This is a great option for someone who might not have the cash on hand to purchase a new heating unit outright or doesn’t have top tier credit. When you rent your system, there is no upfront charge. We will even install your new system for free as soon as the next day. We can even remove your old unit and install up to 15 feet of duct work without charging you a dime. In addition, we are flexible with our program approval so that we can work with most homeowners. 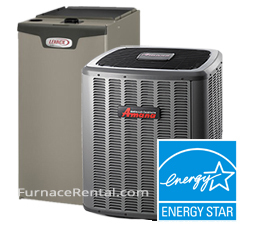 Furnace rentals don’t only benefit homeowners, it is a great option for landlords and business owners too. By choosing a rental agreement over traditional financing options, you are able to have a predictable monthly cost that is easily built into a monthly budget or rental cost. In addition, rental agreements also offer additional benefits. Regular maintenance is included in your rental agreement so your high efficiency unit can keep working as efficiently as possible. If your system ever has any issues you have direct access to us with our emergency line. This line is open 24 hours a day, seven days a week so we can give you expedited service. Our work is covered with your rental agreement, so you never have to worry about or plan for any unexpected costs. You just have the piece of mind that comes with knowing you are in good hands. If we can’t fix your unit for any reason, we will replace it, absolutely free! So, what are you waiting for? All you have to lose are ever increasing energy bills for properties that are being cooled by inefficient units. Why not give your wallet and the environment a break and give us a call? You are under no obligation and we would love to help you decide on the best high efficiency, low monthly cost unit for your home or business needs.